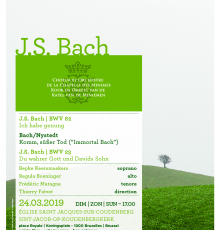 With its moving text celebrating death as a welcome relief, Cantata BWV 82 "Ich habe genug" (It is enough) is one of Bach¹s most famous cantatas. We have performed it several times in its version for bass, and even once with soprano. Now, for the first time, a mezzo-soprano will be singing; and not just any mezzo-soprano, but our favourite diva Regula Boeninger. As the cantata has no final choral, we propose a special one with a modern twist, very much in the spirit of the cantata it follows, profound and meditative. “The cantatas of the Minimes” have become a Brussels institution, already since 37 years. Every fourth Sunday of the month, we present the cantatas of J. S. Bach as the Cantor of Leipzig had done in his time. Free admission at 17.00 for a concert of about 45 minutes in the very beautiful church of Saint-Jacques-sur-Coudenberg where the faithful audience will regularly come for a great spiritual and cultural moment.